Yuccas (Yucca spp.) are succulents that grow in harsh conditions. The yucca’s native environment consists of arid conditions with low rainfall and poor soil. The stiff, leathery leaves are armed with prickly spines. The leaves emerge from a trunk and are dark green to pale blue. This low-maintenance plant is used for ground covers, bedding plants, container plants, shrubs and specimen plants. Yuccas are popular for their dramatic forms and unusual shapes. They are a natural choice for desert scenes. The best time to plant a yucca root is from March until May before new growth begins. Remove weeds and debris from the planting site. Locate the site in an area with full sun, which is six hours or more of direct sunlight. Remove large rocks and sticks from the area. Dig the soil up with a shovel to a depth of 24 inches. Turn the dirt over and break up any large dirt clumps. Spread a 3- to 6-inch layer of sand over the planting area. Mix it into the loose soil. Spread a 3-inch layer of peat moss and mix it into the top 12 inches of soil. This gives the soil a good dose of organic materials. Dig a hole the same size as the yucca roots. Remove the yucca root from its container and prune off any injured roots with pruning shears. Do not prune off any of the top while planting. Place the yucca roots in the hole and cover with soil. Firm the soil around the yucca plant. Drape a lightweight, see-through cloth over the above-ground part of the yucca. This keeps the yucca from overexposure to sunlight while it is establishing its roots. Keep the cloth in place until new growth appears. Water the soil once a week if there is no rainfall. Yucca plants need water until they have their roots established. This may take up to a year to occur. 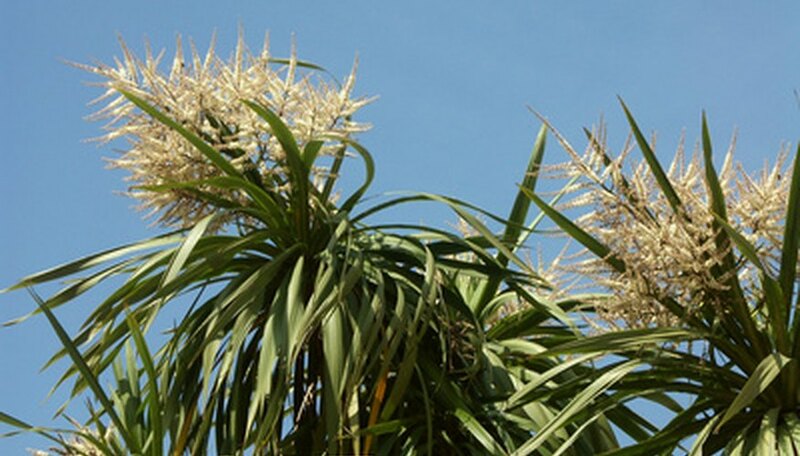 Once established, a yucca can survive on just rainfall. The planting site for the yucca needs winter drainage. The yucca roots will begin to rot in cool, wet winter weather if they are located in a slow-draining area.